How do I change the write permissions for a folder (or file)? Novice Novice tutorials require no prior knowledge of any specific web programming language. As you may already know all the updates to our themes are made directly from the WordPress admin. How this works is that we have some scripts in place that connect to our server, verify if the version on our server is the newest one and then asks you if you want to update. For this to happen there are certain folders where we copy the files that need to have write permissions. We have some procedures in place that automatically sets the write permission on the folder(s) that are used, but sometimes your server prevents our scripts to do their job, so the folder(s) permission needs to be changed manually. This is pretty simple to do. All you need is the path to the folder that needs the write permission changed and a FTP client. 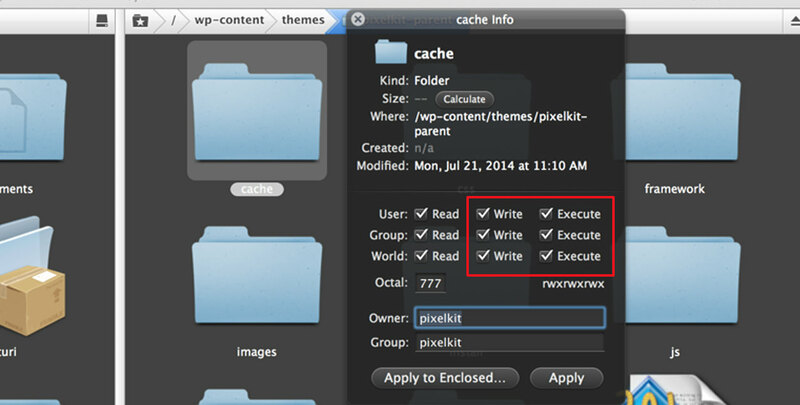 The folder path can be found in the header of your WordPress admin (see image below). Can I use one of your themes on WordPress.com? What’s the difference between Standard and Developer license?